Perhaps this post will come as a surprise to most of you because I took a leave for more than a month! I have no intention of abandoning this blog. Oh no! I love nail art too much to do that. But the truth is, I fell in love. And if you know me personally, you'd understand why I had to take a little time out from blogging. It was unexpected, confusing, and absolutely complicated. Well, we better leave it at that for the time being. For now, let me share with you a freehand nail art I simply called Round and Round because that's exactly how my present life is. 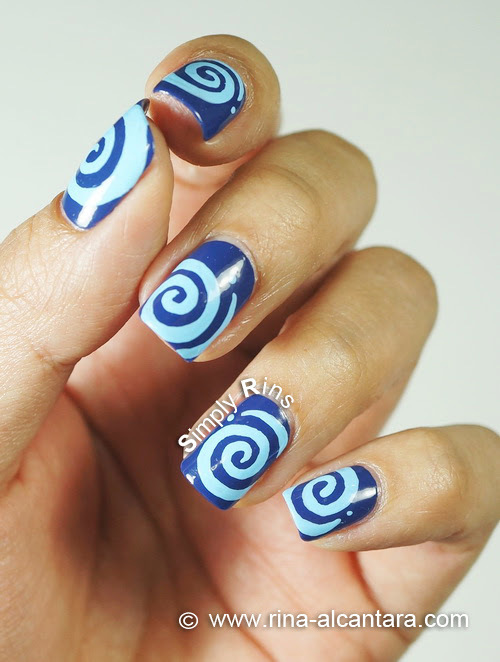 I wanted a simple nail design to express myself and the first thing that came to mind is to paint swirls. Well, if I have one weakness as a nail artist, that would be drawing curves on my nails. But then again, maybe a challenge is all I need to bring my groove back after being gone for quite awhile. I was choosing between blue and purple background. Blue won. My inclination to the color can also be because it reminds me of the water. And perhaps you have heard of the typhoon that hit my country (Philippines) this week that wrecked havoc to properties to a lot of us. The water leak inside my studio is nothing compared to the damage other people suffered. As of this post, the rain has subsided and relief operations are still ongoing. Please include us in your prayers. Sorry for that side note. Base color is 2 coats of Dazzle Dry Mystic Blue 4U (swatched here). And I hand-painted the design using acrylic paints and a detailing nail art brush. Anyway, I'd like to share that painting curve lines on your nails is more manageable if you use a detailing nail art brush with shorter bristles because you need to hold the brush as vertical as possible to get clean lines. It would also help if you water down your paint a little more so that the pigment would slide easier as you draw. Oh, and did you notice that dot I placed on each nail? I added that for drama. 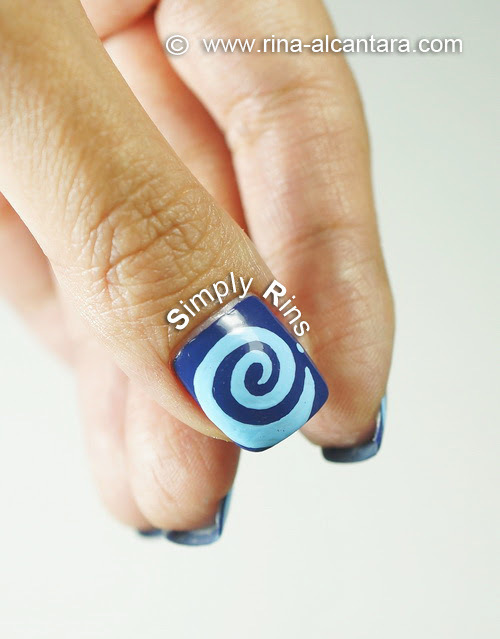 I didn't want the swirls to completely cover the nail bed so I opted for an open ended swirl and placed a dot on the end. I personally think that details like this makes a difference in the overall impact of a nail design. 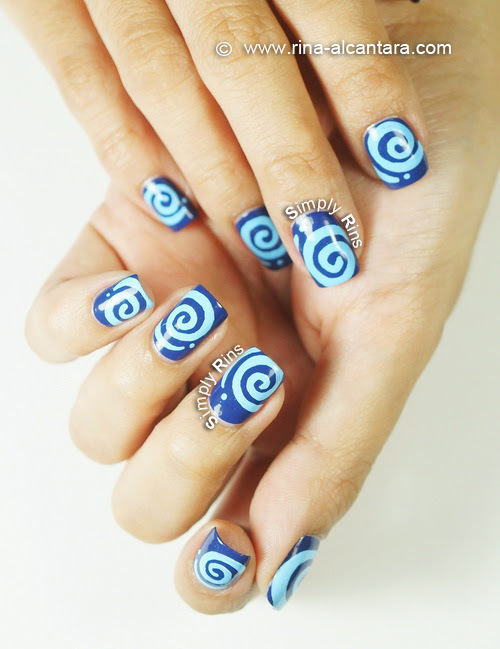 I also chose a lighter blue paint color for the swirls because I thought using white would be a little bold. Although I think white would highlight the background polish more. If you are more adventurous, perhaps you can use contrasting colors like yellow or bright orange. Thank you for welcoming me back. I guess you can say that vacation is finally over and I need to get back to business, so to speak. I'm looking forward to reconnecting with the nail art community and see what I missed! You can probably help me by leaving me a message below. Welcome back! You have been missed, but I'm glad to hear you had some happy events taking place. Your freehand work always amazes and inspires me. I check for new posts on your blog daily and in fact I'd already checked today when I switched to Facebook and saw that you posted right after I checked. Lol super glad to see you hope your family and friends are alright after the typhoon. Look forward to all you do! I hope I'll continue to inspire you. Welcome back Rins! And can I say I went kilig when I read of you falling in love? :D Good luck and enjoy it! I'd say love is always worth the confusion. Awesome swirly pattern btw, the dot really brings a quirky factor to an already cool design. Hi there, I am recently new to the blogger world and new to nail art as well, I came across your site via Pinterest and glad I did. Your blog is a great inspiration as I too have painted :) Glad to hear that things are going well with you on a personal level:) Take care and please keep posting. Also, I just noticed you have an Instagram account so I'm wondering how in the world I wasn't following your already! All fixed now. Love is bad for the business. Hahaha!!! Kidding. I love you...and you know that!! !